Like all other plants, a pine tree has specific habitat requirements. And factors such as soil nutrient levels, available sunlight or soil pH can positively or negatively influence its growth. If your pine appears to be faring poorly, a number of variables could be slowing its growth or impacting the tree's overall health. Fortunately, most of these problems can be overcome using simple equipment readily available at many nurseries and garden centers. Like any other plant, a pine tree needs care to flourish. Collect a small amount of soil from where the tree is growing. Use your soil test kit to determine the levels of macronutrients, such as nitrogen, phosphorus and potassium, that the sample contains. Based upon the test results, acquire and apply fertilizer to increase any deficiencies. As an example, if the soil lacks nitrogen, an application of fertilizer such as 10-0-0 will provide the tree with the needed nutrition. Examine the condition of the needles. If all have yellowed, it is a sign that your tree is suffering from iron chlorosis. Acquire iron chelates and surface apply the product based upon the manufacturer's instructions. Test the pH level of the soil using your pH probe. For an eastern white pine, for example, the optimal soil pH level should be slightly acidic, in the 6.5 to 6.8 range. If the pH level is well above 7.0, the soil is too alkaline. Acquire a quantity of garden sulfur and surface apply it to the soil around the tree. If the pH level is significantly below the optimal range, your soil is too acidic. A surface application of dolomitic lime will sweeten the soil back to the proper pH level. Examine the soil for signs of excessive dryness. 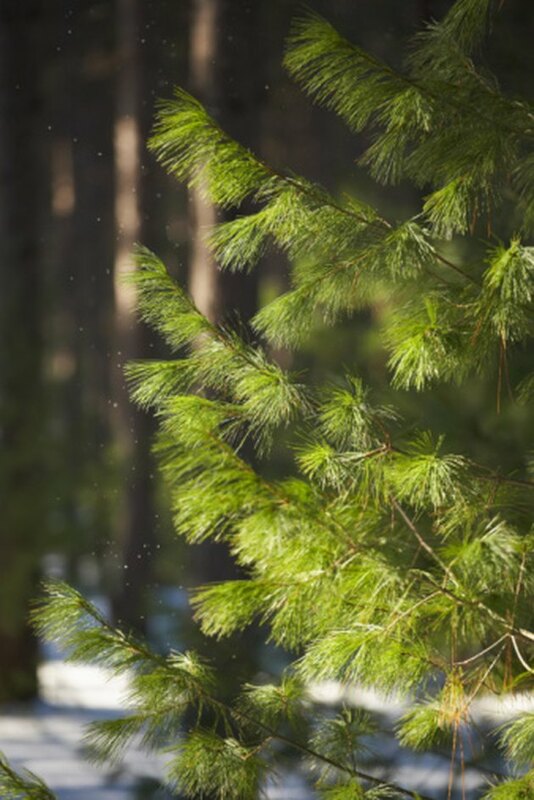 A white pine grows best in moist soil. If the limbs appear droopy, water the tree thoroughly and establish a regular schedule for watering it on an ongoing basis. Inspect the area around the tree. If it is shaded by the limbs of other trees or growing among tall weeds, your tree lacks adequate sunlight. Remove the tree limbs creating the shadows and carefully mow or pull the weeds or other vegetation. Do not apply weed killer or herbicides. Your tree is already under stress, and these chemicals can kill it. Wait a few weeks and observe any changes in the tree's growth habits. If the green color begins reappearing in the needles, new growth commences or the droopiness of the limbs has disappeared, your efforts have succeeded.